Have you grown ‘Villia’? I don’t think you would have forgotten if you have – just look at that colour! In May this year, at Garden Show Ireland I bought this rose, among other plants, from the nice people at Galloway Plants (http://www.gallowayplants.co.uk/ ) who make the crossing every year to sell their unusual plants. 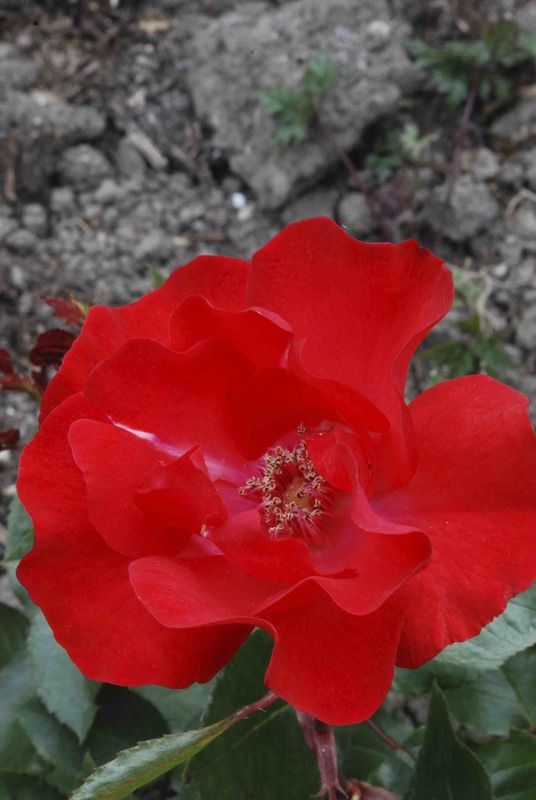 I was encouraged to buy this odd rose because I was, as ever, looking for something unusual and was told that this rose had been rescued from the garden of Michael Haworth-Booth. Although he is best remembered for his love of hydrangeas he was interested in most shrubs and apparently he dabbled in rose breeding. I was told that this was very uncommon and had bright red flowers. The first bloom on the small plant opened today and, in the heat, was transformed from a bud this morning to a fully open bloom by this evening. I forgot to smell it but even if it doesn’t smell this is a rose that you can’t miss – even with just the one flower! It needs careful placing in the garden I think. Anyway, it is called ‘Villia’ and I would love to hear if anyone knows anything about it. So far I have found nothing. It seems healthy so far and it may be a useful rose – time will tell. Do you have this rose or have you ever grown it?